**Sorry about all the flickr issues! I think I have it figured out- I switched photo servers and I'm still getting the hang of it. The weird part was that it was showing fine on my computer but "this image can't be displayed" on my phone. Hopefully it's fixed now! I thought I'd do a post on how I decide which appliques to put on Luke's shirts. This isn't a random process and sometimes it takes me more time to plan than it does to actually stitch out the designs. 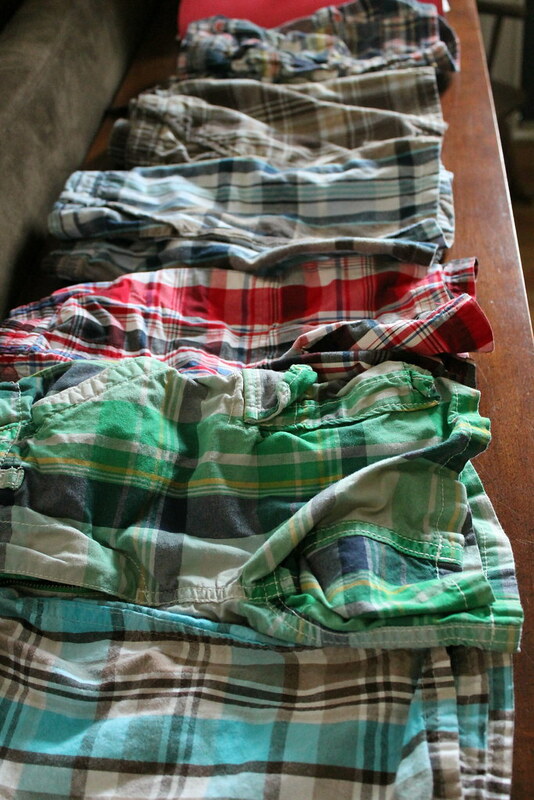 It's no secret that pretty much every shirt/pair of shorts that Luke owns is from a consignment or thrift store. 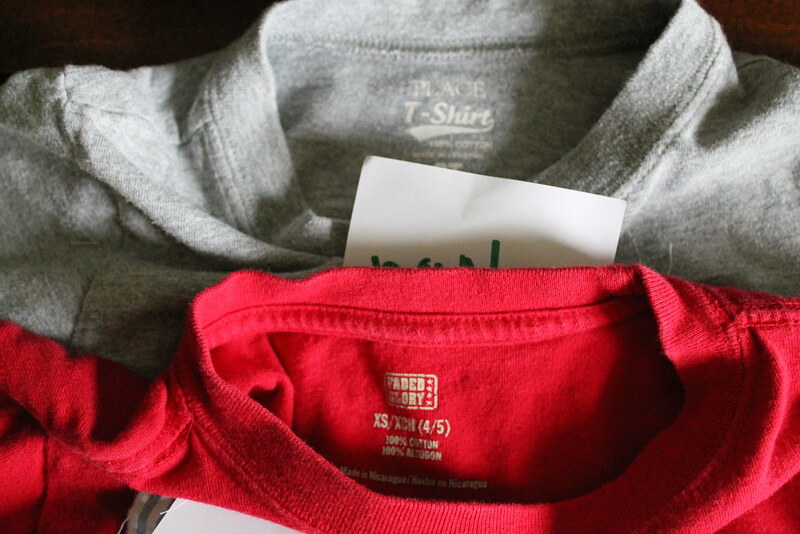 After spending $1.50-$2.00 on shirts I just can't fathom how people spend $8-10 new on children's clothes! Inspiration is KEY. 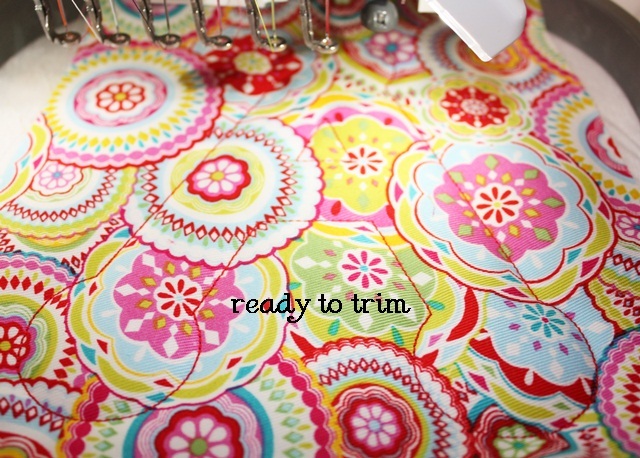 If I am not inspired, I won't want to sew. I have to find pictures of appliques that inspire me or colors that inspire me. 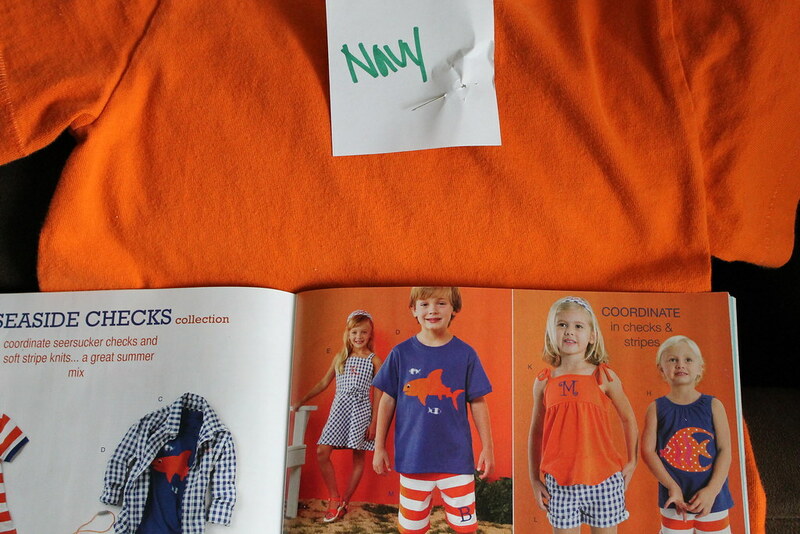 Every season (or whenever they release a catalog) I request a catalog from Kelly's Kids. I also always go to the facebook sites I follow that also do applique. Sometimes it's a personal business I follow and sometimes it's the applique business I follow. Either way they are full of great ideas (color and fabric inspiration)! 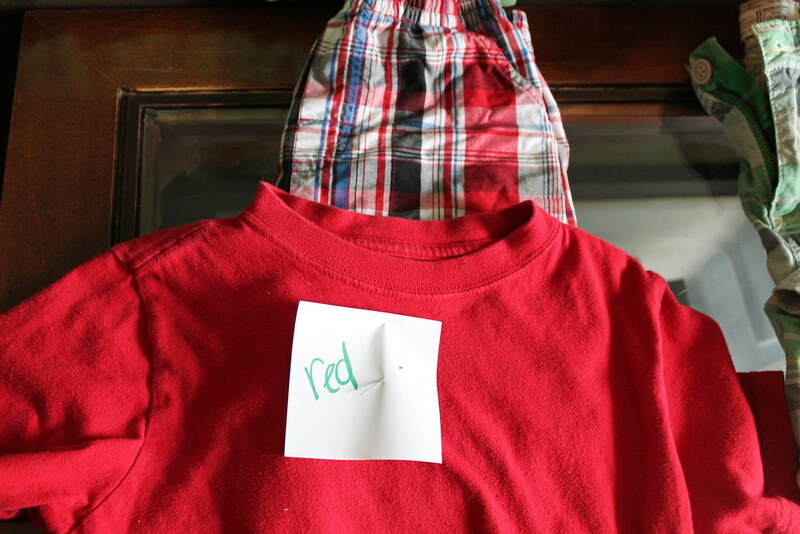 If I'm stumped on a color I'll check out how Kelly's Kids used that color and what accents they used. It's always fun to get new ideas! Also The Company Store, Shrimp and Grits, and Rags Land are all awesome places to find inspiration! 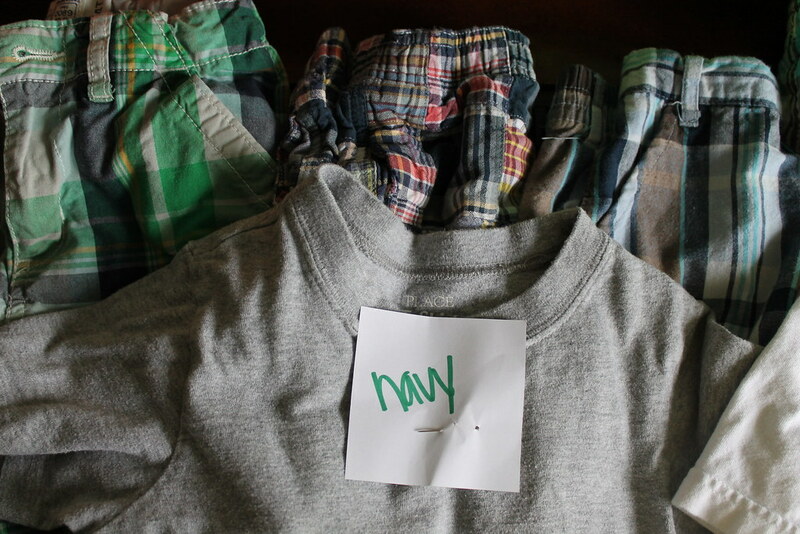 Obviously the first thing I do is lay out what I have. I need to see what colors I'm working with in order to decide what applique/accent colors/fabric to use. 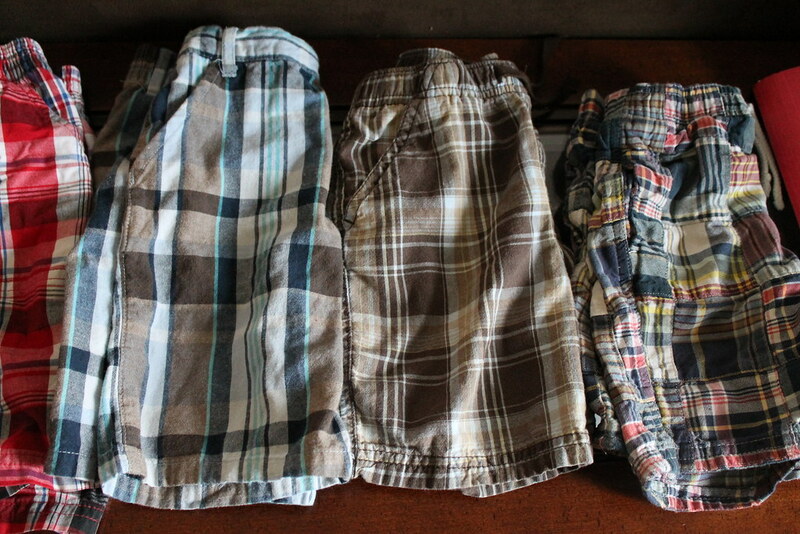 The main issue I constantly run into is what a sucker I am for plaid shorts. It's AWFUL! They are so preppy and cute, I just can't say 'no'. But they are tough little boogers to match when it comes to appliques. I always quickly label the color of the applique accent fabric I'm thinking before I forget. In this case a brown applique on the white shirt matched the best, and a navy applique on the gray shirt worked well with the plaid. I decided on a crab in blue seersucker. I have to make the little notes to myself to help me remember what I'm thinking, but those original notes are in no way set in stone! I go back and change my mind all.the.time. 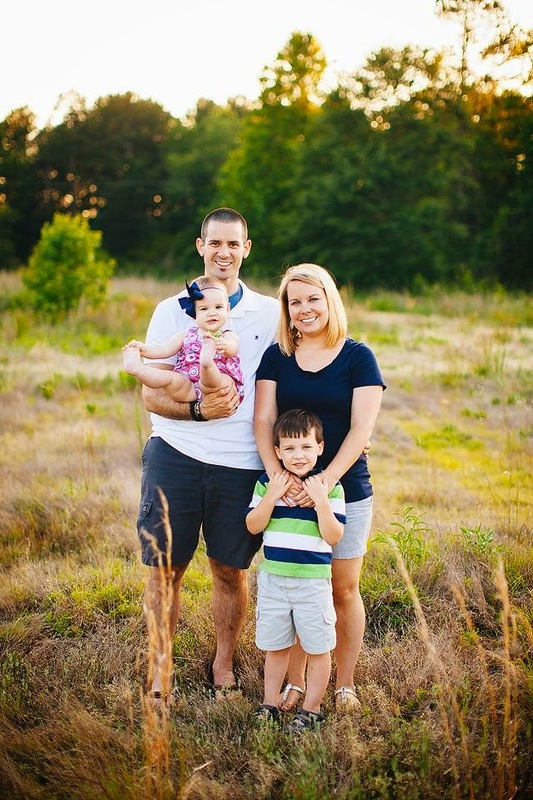 I mentioned briefly at the beginning of the post how I find inspiration. I try to use what I have first to save the most $$. 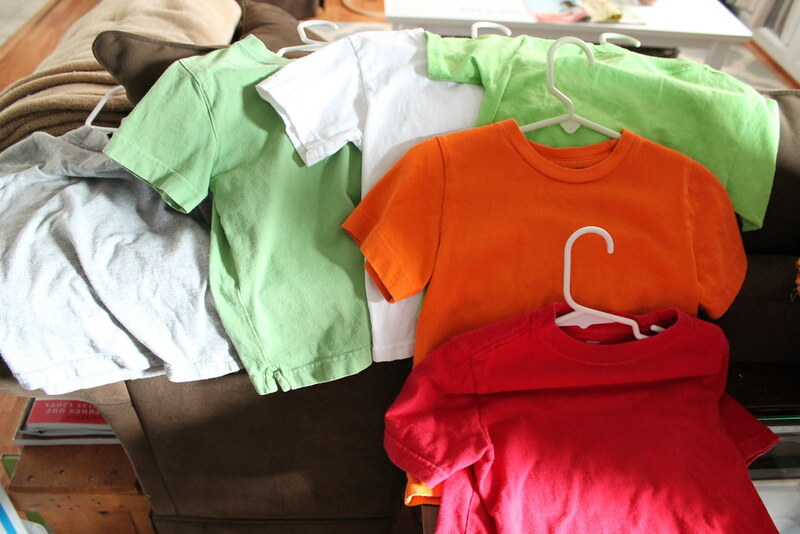 When I started planning these shirts, I brainstormed a list of appliques I have already purchased. Josh vetoed the whale- he said it looked too babyish. 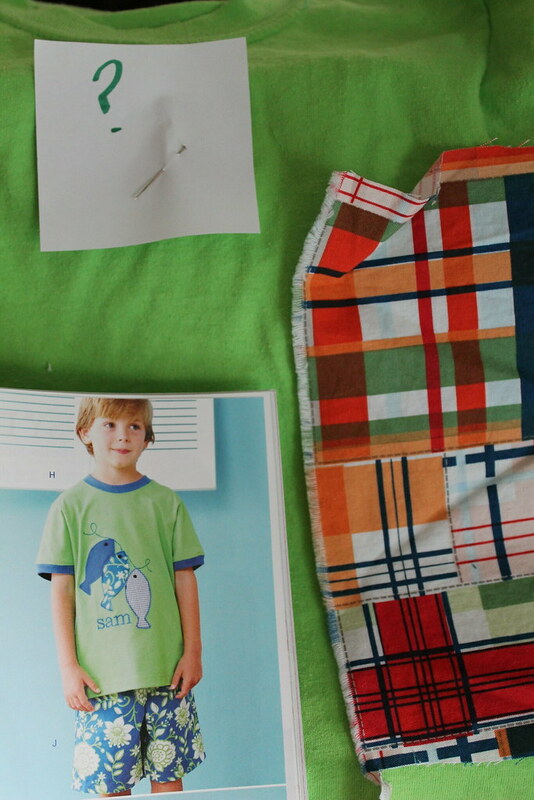 I loved the tree swing applique, but it was going to have to go on the white shirt and the green in the tree wouldn't match the blue/brown plaid shorts. 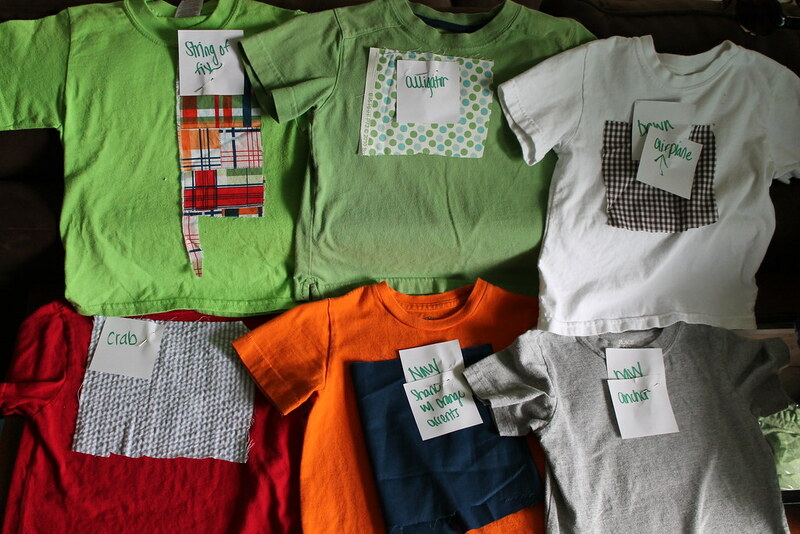 I went about putting labels on the shirts so I would remember my ideas. I'm also ok with buying new appliques. I just want to make sure I make the most of what I have. Fabric comes next! 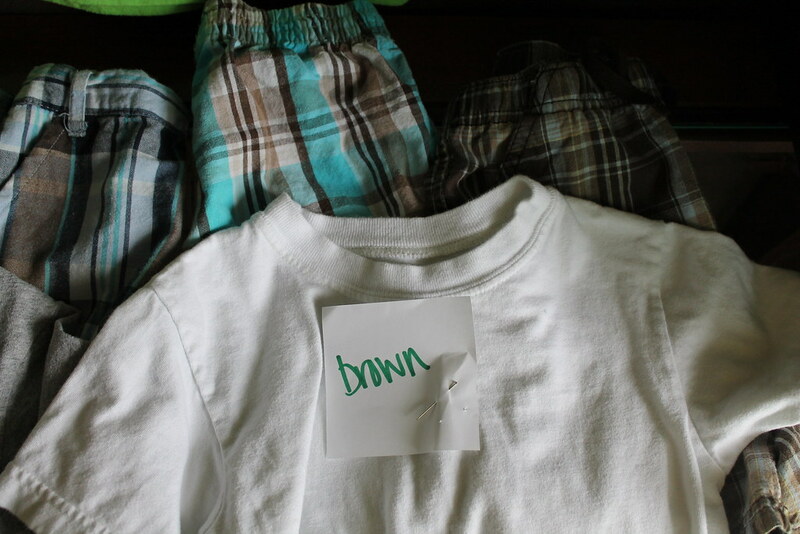 I have to make sure and double check that the shirts and the applique fabric I choose will 100% match each pair of shorts (whether they'll be paired with the plaid shorts or khaki/navy shorts we also have). 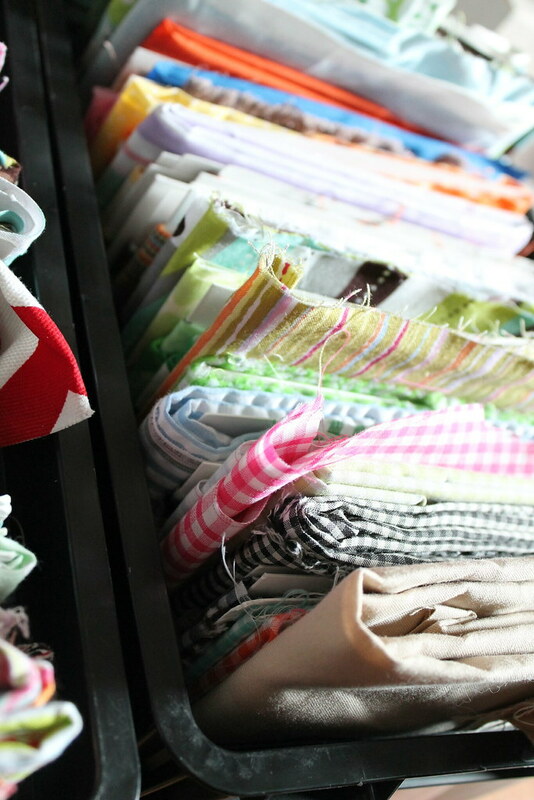 When the office/sewing room became a nursery, my stash had to be contained to this filing system that fits in our hall closet. 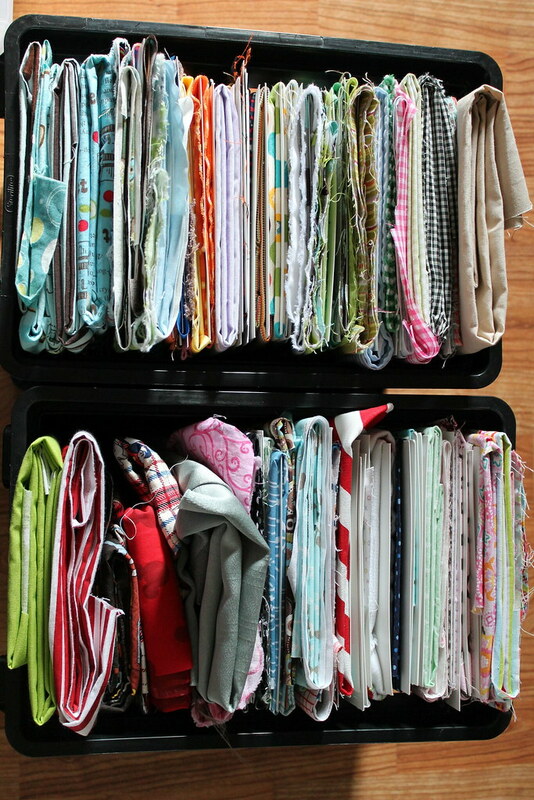 I also have 2 scrap bins (one with patterns and the other solids) that I try to raid before cutting more. I usually find half of what I need in the scrap bins and the other half I cut from the "bolt". I've found that when working with plaid, the less busy the accent fabric, the better. 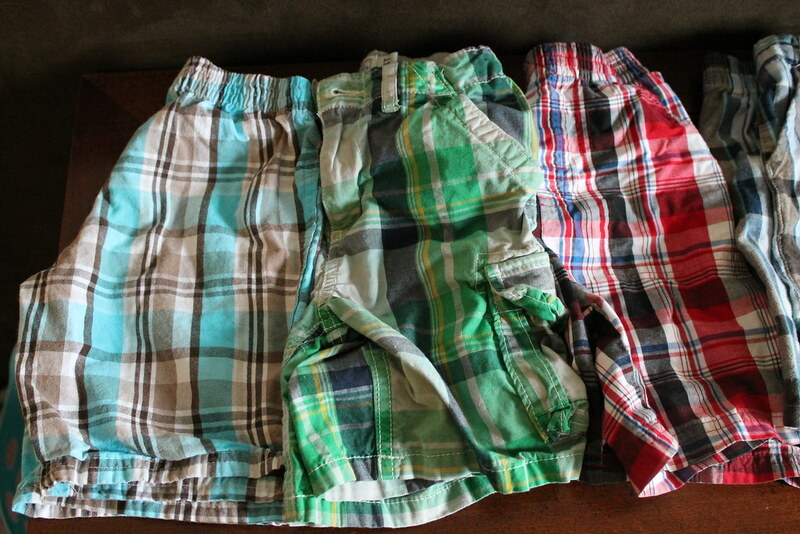 Solids and gingham seem to work best. I go slow, take 1 shirt at a time, keep in mind the original color that I already noted on the shirt and try to find fabric that matches all the criteria. I also have to keep in mind the appliques that I'm thinking of using. 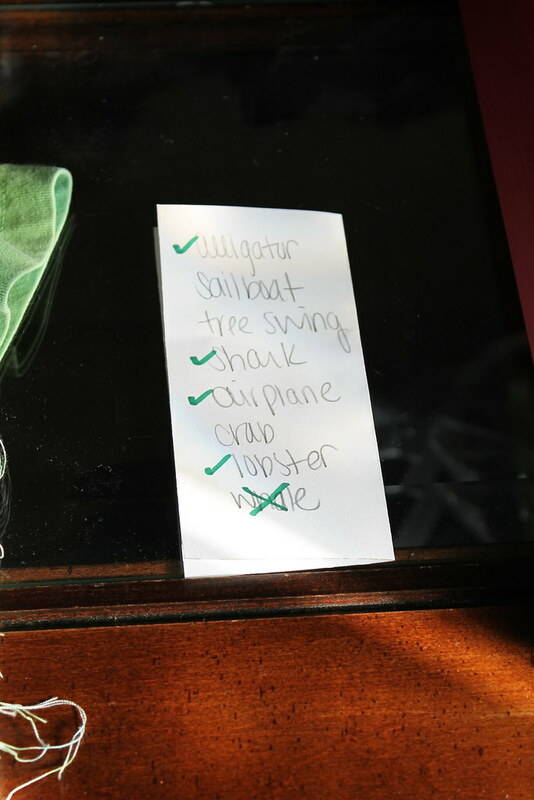 A lime green crab would look weird and so would a blue alligator. The applique that I'm thinking HAS to complement the accent fabric AND the color of the shirt. Sometimes it's at this point that my head starts spinning. 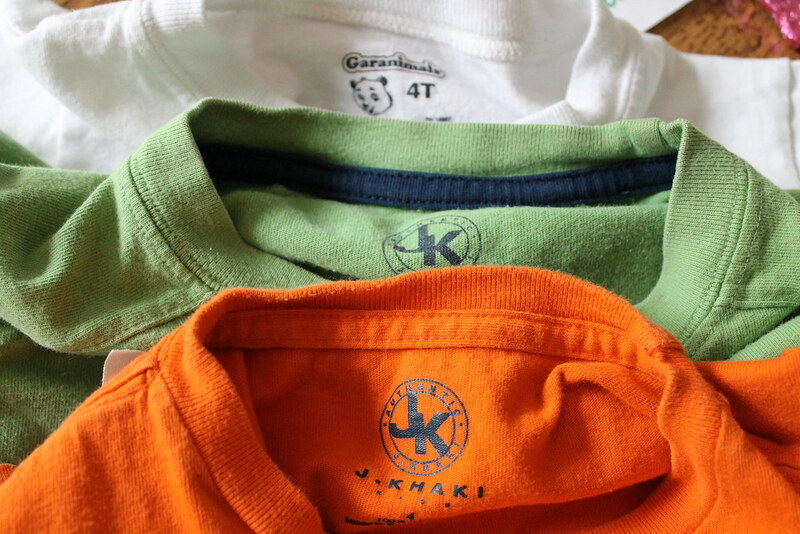 Here's what my shirts look like after I've made all these decisions. 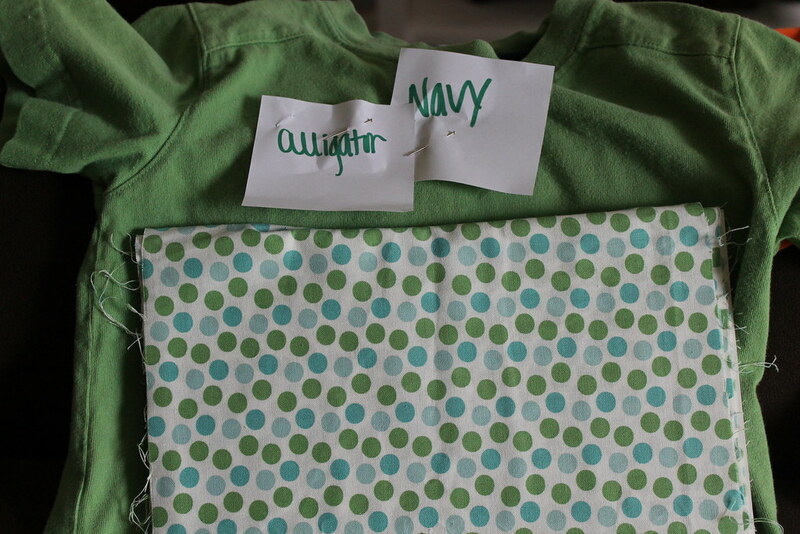 Most shirts have the applique idea note pinned on and the fabric I want to use. That picture above is super deceptive because it makes this process look easy... but sometimes I change my mind (like I did with the red crab to the blue crab that I mentioned before). 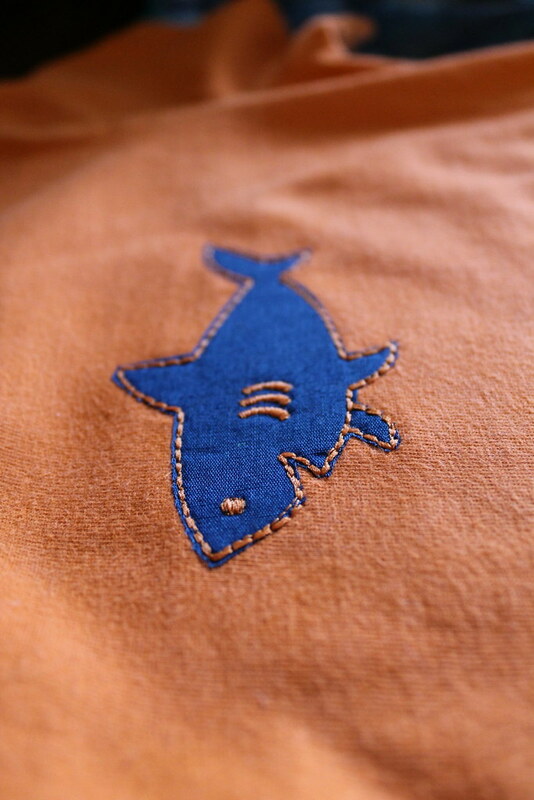 On the green shirt below I had planned something TOTALLY different (a navy shark) to begin with. After thinking and finding a fabric that coordinated with the green shirt perfectly I changed my mind to a polka dot alligator. ...I remembered that my favorite applique designer ever (appliquecafe.com) had a similar applique so I jumped online and found this adorable applique that almost exactly matches the KK one. 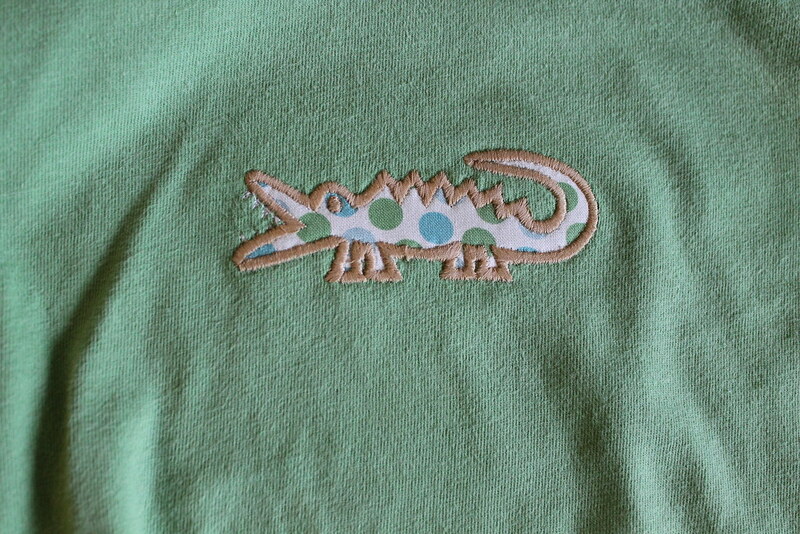 A very similar applique was used in the Kelly's Kids catalog last year. I liked their use of the madras plaid. 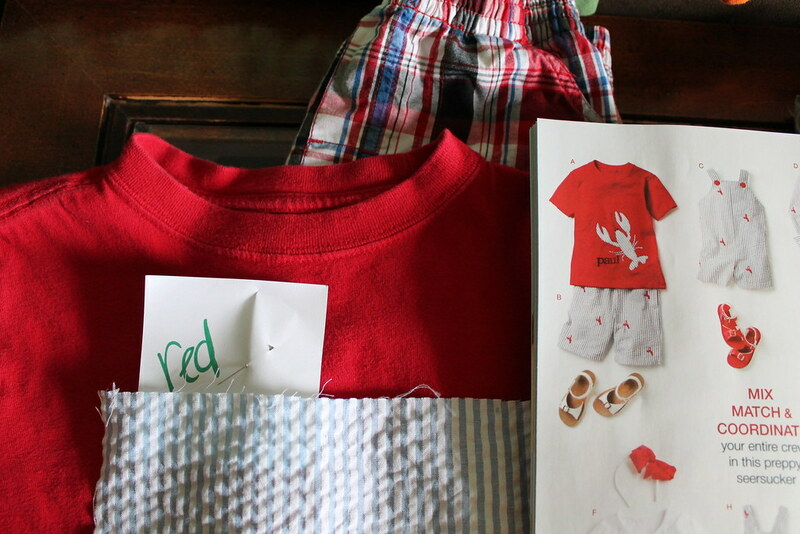 It's quite a process to lay all this out and try to figure it all out, but it will make matching his outfits so much easier in the long run. The next step is stitching it all out. 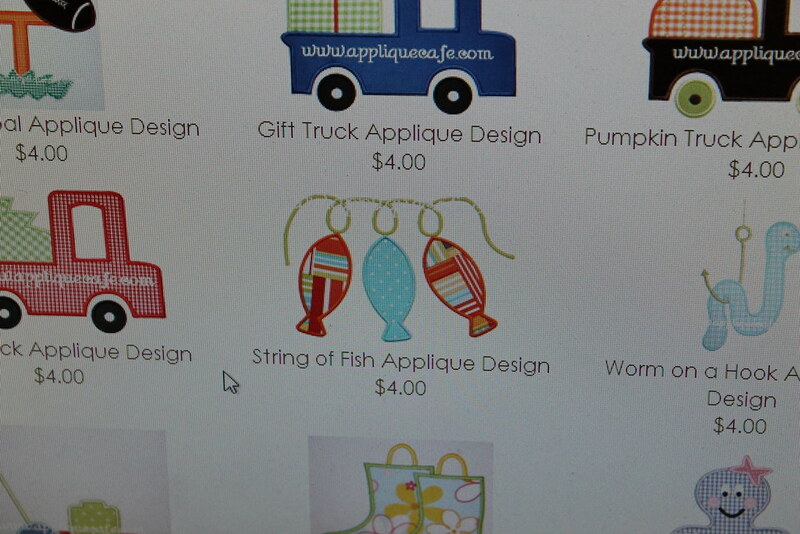 If I have to purchase any appliques I wait until they go on sale. Many times applique designers will mark appliques down around the holidays or season changes. 30%-40% is a huge savings! In this case I have to wait on the string of fish, the anchor, and the crab. I have already purchased a crab, but I have my eye on a different one. Although the satin stitch is beautiful and clean looking, it takes A LONG TIME and alot of thread. 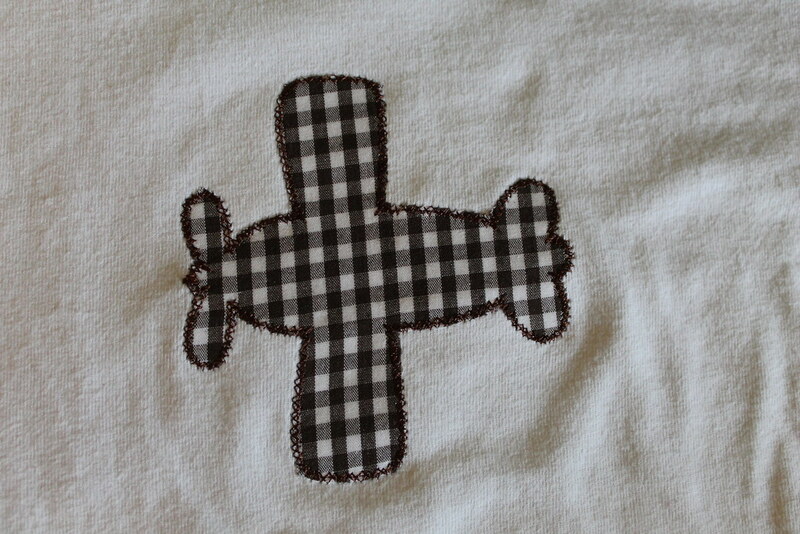 The airplane design I had was ready for the satin stitch, but I simply stopped my machine after if went through the zig zag process. I stopped it RIGHT at the stitch where it was about to start the satin stitch. It cut the time for making this shirt from 25-20 minutes to about 15 minutes! And I LOVE how it looks almost vintage! I plan to use this process alot in the future. Of course I still love the satin stitch! But it sure is nice to stitch out 2 shirts in the amount of time it would have taken me to do 1! Also I back all my appliques with heat and bond light so there will be minimal fraying with this design. Although so much time and effort is put into this process, when I see shirts selling on etsy for $10-$35 each I consider it a success that I spent less than $20 on 6 shirts and they are customized EXACTLY how I want them (6 shirts @$10 each would be $60- which means I am paying/saving myself a MINIMUM of $20 an hour to whip these up). Also as much as I LOVE Luke's name being on things, for resale I am steering away from that. I also love that he loves the animals and objects on his shirts! He absolutely loves sharks and airplanes and I can customize that to fit him and his personality and each time I get my machine out he asks if I'm making him a shirt. As soon as I get the other 3 appliques ordered and the shirts stitched out, I'll share them here!